US Commerce Secretary Wilbur Ross will be in India from 13-15 February along with a group of American CEOs. 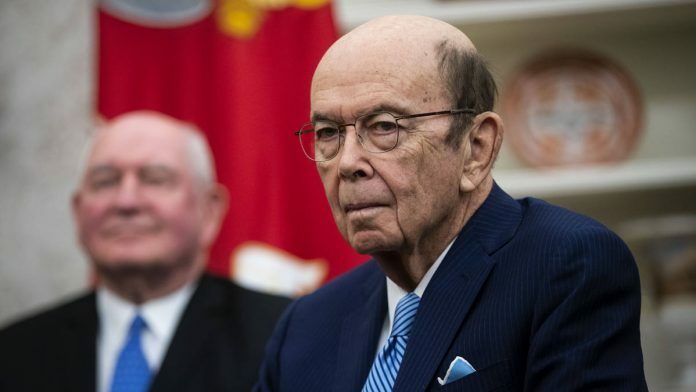 New Delhi: US Commerce Secretary Wilbur Ross’ much-awaited visit to India may turn out to be a damp squib as bilateral trade ties have hit an all-time low, with issues such as foreign investment in e-commerce and data localisation adding to tensions. The India-US trade relationship is marred by a host of factors, including their trade deficit and Washington’s long-held grievances with what it sees as New Delhi’s lax intellectual property enforcement. Recent irritants have included India’s tightening of rules for foreign e-commerce players and New Delhi’s push to retain Indians’ payments data in the country, which has forced American firms such as Visa, Citibank, Amazon and Mastercard to set up servers here. According to sources, Ross, who will be in India from 13-15 February with a handful of American CEOs, is visiting with the sole agenda to “pressure” India into changing its policy stance on foreign investment in e-commerce, which has impacted the business interest of Walmart (the majority owner of Flipkart) and Amazon, as well as data localisation. Ross will be holding a dialogue with his Indian counterpart Suresh Prabhu on 13 February, while the India-US CEOs Forum is scheduled to take place on 14 February. Ross departs for Washington on 15 February. The CEOs accompanying Ross include James Taiclet of American Tower Corporation, Douglas DeVos of Amway, Antonio Neri of Hewlett Packard, Douglas Peterson of S&P Global, and Dan Schulman of PayPal. Ross, who is regarded as a close aide of US President Donald Trump, is coming to India at a time when the countries are struggling to find common ground to push ahead with the long-pending India-US Trade Policy Forum (TPF), the only dialogue on trade between the two countries. Supposed to be an annual interaction between the Ministry of Commerce and Industry and the US Trade Representative (USTR), the TPF was last held in Washington in October 2017. It was scheduled to be held in New Delhi last year, but got cancelled over the raging debate between India and the US over data localisation. According to sources, the countries are still locked in a discussion on the issue. “We are at a point where action is required to break the impasse to avoid worsening trade ties,” said Rick Rossow, senior adviser and Wadhwani Chair in US-India Policy Studies at the Center for Strategic & International Studies, Washington. “A cabinet-level TPF meeting is now meant, at least to the United States, to consummate specific steps to remedy existing trade concerns. The problem is a lack of progress, not the lack of a meeting,” he added. Rossow added that the Trump administration was now more concerned with steps that increase US exports, rather than policy issues around outbound investment. The US’ trade deficit with major trading partners has been among Trump’s biggest peeves since assuming office. Trade deficit is the imbalance between the exports of two trading partners to each other — and Trump has been imposing tariffs on imports in a bid to bridge the gap and boost local manufacturing. India currently enjoys a trade surplus of $21.27 billion with the US, according to the data by the Ministry of Commerce and Industry in 2017-18. The US is now threatening to pull the plug on granting trade benefits to India under the Generalised System of Preferences (GSP), which grants some Indian exports preferential or duty-free access into the American markets. Sources said although GSP benefits amount to a gain of just $200 million for India, it will impact jobs in labour-intensive sectors such as textile, leather and footwear. This, in return, is likely to impact the Modi government negatively as India faces elections in the next couple of months. India is now closely watching how the US-China trade negotiations play out — Washington and Beijing’s trade war is on hold till 1 March, by when both sides are expected to reach a deal. If both sides fail to reach a deal, then the US will impose tariffs worth $200 billion on Chinese imports by raising duties to 25 per cent from 10 per cent. “The tariff war has provided market-access opportunity to India,” said Ajay Sahai, director general and CEO of Federation of Indian Export Organisations (FIEO), adding that this was the right time for India to negotiate a free trade agreement with US.